They say that one symptom of depression is not bathing, and what is recession other than economic depression? So, with all that non-bathing, we’re left with an important national issue – rampant greasy hair. I think a new Nobel Prize category should be launched – advances in lazy grooming – and the first winner should be Mr Batiste. Batiste dry shampoo, which comes in a range of scents and costs less than £2, means we can all save money on those premium shampoos by only washing our hair every two to four days. One colleague of mine went as far as seven days (in the name of science of course) but I don’t know if I’d go that far. A word of warning – it’s white, so the first time you use it, don’t be surprised if you look like an old lady/gentleman at first, but you’re meant to brush it out, so it does blend. Don’t use this after you’ve dressed, especially if you’re wearing black! Available from pretty much any Boots or Superdrug. Bumble & Bumble’s hair powder is very similar to dry shampoo, but it comes in a range of colours. It does need to be sprayed close to the roots – I learned this the hard way, after covering my entire bathroom with a thin dirty blonde coloured film. This is more expensive than Batiste (about £15 to 30) but it sort of doubles up as a styling product, as it can give your hair more lift and volume. Available at Space NK and online at HQ Hair. 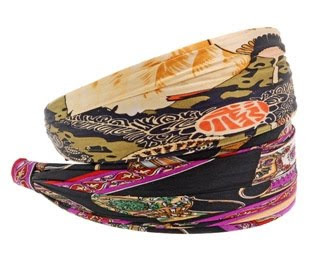 Look in any magazine or watch any fashionable programme on telly and you’ll see that headbands are indeed back, and the bonus is they’re great at hiding a multitude of sins. Goody makes some non-slip ones available at Boots. Blax make a headband version of their fantastic snag-free hair elastics, which you can get at HQ Hair. Or you could go the high-end direction and get something sparkly and wonderful from Cherry Chau (at Harvey Nichols) or Deepa Gurnani (at Net-a-Porter or Liberty).